Online card games are very popular and one type of game that enjoys a lot of attention from players on the internet is poker. This reminded me that Netflix has an anime series called “Kakegurui” or “Compulsive Gambler”; where the main protagonist of the series – Yumeko Jabami, seems to be very lucky with card games. Just like what the characters did in the anime, game makers design several different versions of poker, rather than just the standard game, to help satisfy the demand. You’ve got Stud, Texas Hold ‘Em, Omaha and more – there are cash and tournament games, ensuring there is something for every type of poker player. But remember, you’ll have to be of legal age to play these kinds of game. Check out more below. 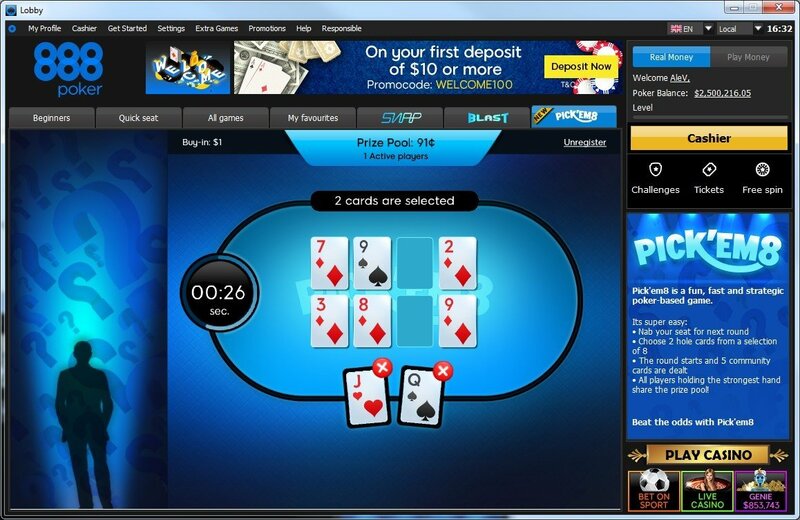 888 Poker are among the leaders of the industry when it comes to their online poker offerings. They are continuously developing new poker games guaranteeing their players are spoilt for choice. One of their newest, most impressive games is Pick ‘Em 8, which has been received positively by the online gaming community. It’s fast paced, it’s easy to play and it’s fun. Not only that, if you’re looking for a game that allows you to quickly multiply your winnings, this could be the one for you. It’s just straight rounds of poker. The prize money depends on the number of people playing. The more people who play, the greater the pot, and you can see the pot growing larger in real time. You pick the game you want to play from the list of upcoming games, which also features their buy-in amount — this will be $0.25 or $1 — and then join the game. Before starting, the player must select 2 hole cards and lock them into the game quickly before the game starts. If the game starts and you haven’t locked in your cards, the system selects two cards for you automatically, which it does by choosing the two you’ve selected, or if you’ve only selected one but not locked it then by choosing the card to the left of the selection. The round starts and the game deals five community cards, which the player combines with their hole cards to produce a standard Texas Hold ‘Em Poker hand. When all the cards have been dealt, you’ll see the hand the other players have chosen. Texas Hold ‘Em Poker rules determine the strength of hands themselves in this game and the player(s) with the strongest hand will win the prize pool. You’ll receive a virtually instant notification once the game deals the community cards, if you’re lucky enough to have a winning hand. What happens next is up to you. You can either play another round or just return to the casino lobby. Hold ‘Em 8 is an intriguing variant of poker but the style of the game has something of a casino feel to it. This is despite the fact that you’re playing against other opponents, an element which helps the game to retain some of its poker-ness, so to speak. If you’re new to poker, it will likely please you to know that the game doesn’t require any major poker-playing skill. There’s some minor decision making, — namely, choosing your hole cards — but all in all, the game is mostly about luck and having fun. Better still, you don’t have to gamble a great deal of money if you don’t wish to. It’s a useful introduction to how poker works and, as you get more advanced and as your winnings grow, you may switch to more strategic poker games. The fact that there’s no betting on the rounds makes the game more straightforward. You’re just buying into the game and getting on with it. This simplicity and the general ease of play is making the game popular in the community — even with more advanced poker players who are just looking to play a few swift hands and make a few speedy dollars rather than spend a long drawn out session at the tables. 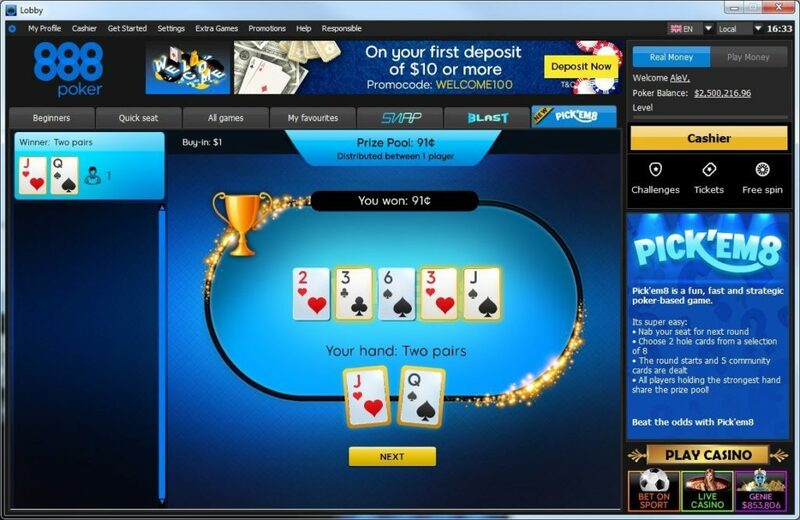 The simple design of Pick ‘Em 8 makes the game ideal for playing on the go and 888 Poker have developed an app to make this possible so that you’re not just confined to your desktop. Once you know your way around the online poker table, you could move on to something even faster, such as Snap. The game is available in Cash and Tournament formats and is designed to reduce waiting times between games. The minute you fold your hand, Snap will deal you a new hand. Alternatively, you could try your hand at 7 Card Stud Poker, where you’re up against no more than 7 other players and, as the name suggests, have a board of up to 7 cards. The game allows lower betting amounts in the earlier rounds, whereas in the later rounds the betting amount tends to be higher. If you’re looking for something new to play, you should definitely try Pick ‘Em 8. It’s straightforward and you can multiply your winnings quickly and easily while enjoying the thrills of online poker.